Ok, a meal in a pot. That’s what this soup is. Everything you need (your protein, grains, veggies, and deliciousness) are in this bowl and it makes for a great dinner on a cold night. Ever since the temperature dropped dramatically last week, I’ve been craving making soup. And I find the first soup of the season is always special, because it holds all of your soup-hopes-and-dreams that you’ve been saving up since last winter. 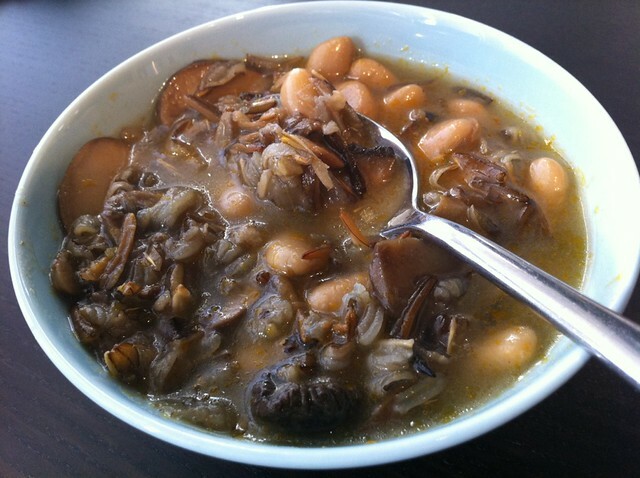 Last winter I was eating a whole lot of mushroom soup. And this year I wanted the mushroom flavour, but a more hearty and filling soup so I didn’t need a second dinner after having a big bowl of soup. So into the pot went some grains and beans — I had wild rice and white beans on hand, so that’s what I used! You can save time here by using pre-cooked grains. If you haven’t planned ahead, throw your uncooked grains in the pot and your cooking time (here 50-60 minutes for wild rice) are the cooking time of the soup. If you have some leftover cooked grains, feel free to toss them in, and then shorten the soup-simmering time to about 20 minutes. I think that barley would be great in this soup, or quinoa for extra protein, or even some brown rice or wheatberries. 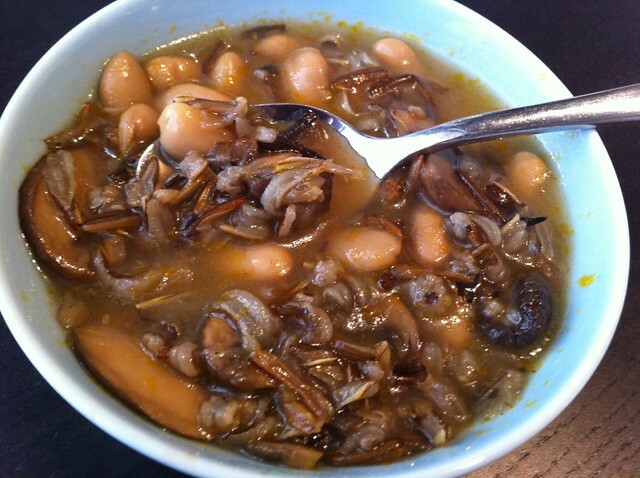 If you don’t have dried mushrooms, use just another 225g (8oz) of fresh mushrooms. And if you want to go vegan with this soup, just add an extra tablespoon of olive or coconut oil (yum!) and leave out the butter. Feel free to also through in some greens just before eating — kale or collard greens would be great here — throw it in the pot just before you eat, and take it off the heat when the leaves are still bright green. Whichever way you decide to go with this soup, I hope it keeps you happy and warm. In a large pot, melt the butter and heat the olive oil over low heat. Sweat the onions and garlic until the onions are translucent. Add the mushrooms and paprika, and saute until the mushrooms are soft. Add the water or vegetable stock, along with the dried mushrooms and the wild rice. Turn the heat up to high and bring the soup to a boil, turn the heat down to low and simmer for 50-60 minutes, until the wild rice is cooked. Add the white beans and cook for five minutes more. Add the tamari, and serve hot. Wow this looks absolutely delicious!! I love mushrooms so I know I’ll have to try this recipe out this week!